We’d love your help. Let us know what’s wrong with this preview of Adkar by Jeffrey M. Hiatt. To ask other readers questions about Adkar, please sign up. I was required to read this book for work. It does a fine job of explaining the ADKAR methodology. It repeated many of the messages to help you remember. It also provides practical case studies of successful use of ADKAR. What was odd was the case studies of changes that failed because they didn’t use ADKAR. The success stories were about business process changes and even the simple reuse your towel cards in hotel rooms. But the failures include Peak Oil Reform, social security reform and the Cl I was required to read this book for work. It does a fine job of explaining the ADKAR methodology. It repeated many of the messages to help you remember. It also provides practical case studies of successful use of ADKAR. What was odd was the case studies of changes that failed because they didn’t use ADKAR. The success stories were about business process changes and even the simple reuse your towel cards in hotel rooms. But the failures include Peak Oil Reform, social security reform and the Clinton health care reform. Really? They couldn’t cite some change failures that were more on par with rolling out a new knowledge base system at the office? IN ADKAR, Hiatt sets out to show why some changes fail when others succeed; how to make sense of the many methods and tactics for change; and how to lead change successfully. The book scores well on all three aims. ADKAR stands for Awareness, Desire, Knowledge, Ability and Reinforcement – a simple acronym for the elements required to be managed in any successful change process. Through identification and then assessment of all the various components of the change, scores are allocated on a 5 poin IN ADKAR, Hiatt sets out to show why some changes fail when others succeed; how to make sense of the many methods and tactics for change; and how to lead change successfully. The book scores well on all three aims. ADKAR stands for Awareness, Desire, Knowledge, Ability and Reinforcement – a simple acronym for the elements required to be managed in any successful change process. Through identification and then assessment of all the various components of the change, scores are allocated on a 5 point scale to indicate which elements require most attention. It was interesting to note that my review of ADKAR coincided with the sharp rise in oil prices in July 2008 and the resultant impact on world trade. Written in 2006, Hiatt uses the ADKAR model to demonstrate why the world did not learn from the oil crisis of the 70’s. Knowledge scores a 3, Desire and Ability 2, Awareness and Reinforcement 1 – a very powerful demonstration of the application of the model. The book goes on to give practical tips and examples of how each of the ADKAR elements can be developed and implemented into any change process. There’s also a good summary chapter with key points and a tables to show quickly which change management activities will help enable change to occur. This is a useful and practical change management book – easy to read and apply by practising managers. This was another book assigned for our yearly development. This doesn't really tell you anything new if you've read self improvement books for work before. But, it does go over it again in a very easily understood way and has some great examples of the ADKAR principle. ADKAR is a great book about the process of change. It shares case studies to educate you on each part of the process. If you are a CEO or just starting a new job you will find value in this book. If you are going through change or trying to be a change agent this book is for you! It’s an easy read. The one thing to remember is that you can not skip a portion of the process in order to be successful. This book was required reading for a training class I will be attending at work. Actually only the first 9 chapters were mandatory reading, but I figured since the book isn't that long I'd finish it off to get credit toward my 2017 reading challenge! The subject matter certainly isn't a barn burner, but it is presented in a very straight forward manner with a variety of case study examples. So it was a relatively painless quick read. Not bad. Looking forward to the training. 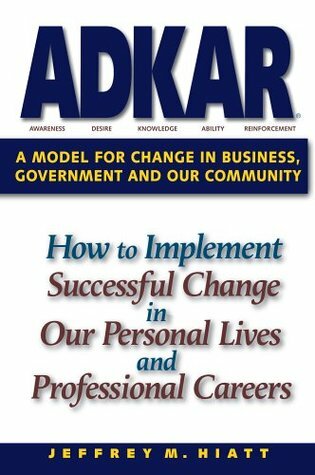 The definitive work for the ADKAR framework for leading change initiatives for individuals and organizations. The book gave me a very clear understanding of the ADKAR process for implementing change management. The book explains very simply that in order for change to occur,within a group of people, that certain things or steps must occur. The book walks the reader through those steps. Great book for beginners in change management. I have a lot of familiarity with the concepts from my job everyday, so I didn't have a lot of a-ha moments, but still a good review. One place that I would have liked to see more thinking is in the role of the manager. In this business climate, managers are stretched to the max (or believe they are). How do you position and implement change so that it isn't another "to-do," but rather part of their mindset? This goes beyond accountability setting to Great book for beginners in change management. I have a lot of familiarity with the concepts from my job everyday, so I didn't have a lot of a-ha moments, but still a good review. One place that I would have liked to see more thinking is in the role of the manager. In this business climate, managers are stretched to the max (or believe they are). How do you position and implement change so that it isn't another "to-do," but rather part of their mindset? This goes beyond accountability setting to the tactical way that information is presented and reinforced. Seems to be missing in most change programs today - the "cascade" is the outdated and often ineffective answer to this question. I really enjoyed these easily understood concepts of the necessary steps towards making effective and lasting changes. It is easy to see where organizations go wrong when they try to change their culture. Every leader should read this book. I can also see the value of having someone in an organization have a background in change management - change is a part of the business world and the better that it is managed, the better and stronger the organization will be. I like the ADKAR model because the concepts are sensible and easy to grasp. However, they seemed a bit simplistic, even optimistic at times. Having been part of a wide scale change implementation, I know how hard it can be to get the support of everyone at the company at various leadership levels. Moreover, some of the examples the book gives are weird, and need to be updated. Nonetheless, I think it's a good introductory book for learning about change management. Reading books for work is never fun. This book was required reading for an internal training course on change management. I wish I could write a business book that described how to do create momentum for change and make millions off of sales to companies who don't embrace change nor really want to change. The ADKAR model for change leadership presents a methodical and clearly understandable process to achieve successful change in both your work and home life. Assessing and coming to terms with your own readiness for the change is key to being an effective change leader. A very straightforward approach to change management. Gives concrete examples and emphasizes the importance of communication in the process. The benchmarking study put out by Prosci is also a helpful tool. A very popular model developed by a leader in change research and consulting. Awareness; Desire; Knowledge; Ability; and, Reinforcement is easy to use and talk about with organizations and people. It draws upon earlier work by Bridges, as well as Kotter. Required reading for work. The AKDAR concept is simple to understand. Book is filled with good example of practical applications. A very good book that can be used as a tool to improve ones personal skills in both work or in life. This book could be a pamphlet. Learn the acronym ADKAR and everything else logically flows from it. The content adds little in the way of new insights. I'd have to recommend passing on this one. This was required pre-reading for a change management course at work for me. Easy read, simple text, good concrete examples. This book was assigned reading for a course I took. It is an easy read. The focus on the individual as a means for motivating successful change implementation in an organization is interesting. Clearly explained a model for change I need to start applying in my work projects. A nice overview of the change model and good process to keep in mind.